Thank you with all my heart for your letter of April twenty-third. I have not the time to do more than send you a line, but it is a line full of affection and of gratitude that you should feel as you do about what I have been attempting. These are certainly times that try men's souls and I hope that the fire will purify the whole nation. 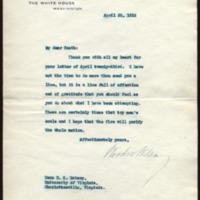 Wilson, Woodrow, 1856-1924, “Woodrow Wilson to Richard Heath Dabney,” 1916 April 26, WWP20508, University of Virginia Woodrow Wilson Letters, Woodrow Wilson Presidential Library & Museum, Staunton, Virginia.